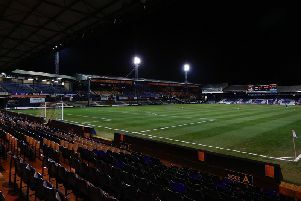 Hatters midfielder Olly Lee had always thought he was capable of scoring the wonder strike he netted from inside his own half during Town's 7-0 victory over Cambridge United yesterday. With half an hour on the clock and Luton leading 1-0, the 26-year-old intercepted the ball a good five yards away from the centre circle. A quick look up saw keeper David Forde off his line, but what happened next was as boss Nathan Jones called it, from another planet, as Lee unleashed a simply outrageous effort that flew over the back-pedalling stopper and into the net. It’s something Lee has eyed up before though and felt he could manage it before his playing days were out, as describing his goal, he said: “It was all right wasn’t? I’m looking forward to seeing it back now. “I’ve eyed it up a couple of times in my career, usually I shank it, so I was pleased that one went in. On his thought process ahead of taking aim, Lee continued: “I just won the tackle, looked up and he was standing quite far out and I just thought why not, give it a go? "I‘ve hit it well and thankfully it’s gone in. “I thought I was quite a way out, sometimes you try these things, they don’t come off, thankfully today was that way. Lee celebrated by making the A sign for his young son Alfie who was in the stands too, saying: “I gave a little A to little Alfie. “He hasn’t been to a game since I last scored, so it was nice, my lucky little omen. Younger brother Elliot Lee was also on target with two magnificent strikes of his own, volleying in with his left foot and then blasting home from 20 yards, but even knew he would be usurped on this occasion. He said: “I can’t even bring him down on that one I don’t think, it was unbelievable. “I think we all know he’s got that in his locker. "He told me he was going to try that this season and today as soon as if left his boot I knew it was in and was off celebrating. Meanwhile, hat-trick hero Danny Hylton admitted that the club's goal of the season award has been settled even before December. He added: “You can close that competition now, the two brothers were trying to have a goal of the season today, they were having a little competition amongst themselves. “Olly has got tremendous ability, he does that, but we’re not too surprised.